Day Two of Healthy Eating Canal House–Style: Today we found beautiful baby bok choy at the farm market to go with our leftover brown rice. 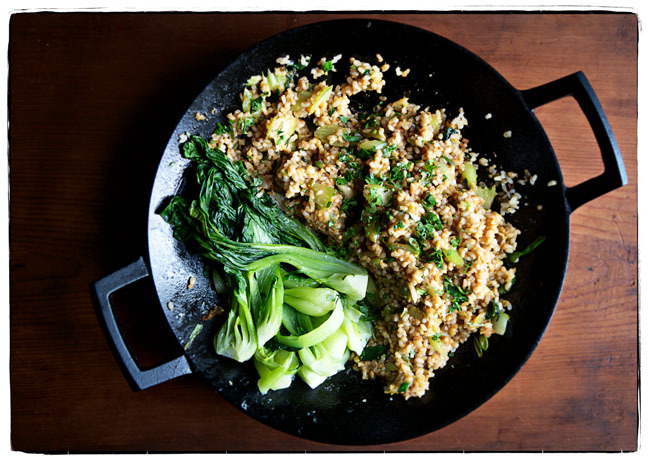 So, our lunch on this overcast fall day is steamed bok choy served with stir-fried brown rice, celery, garlic, scallions, scrambled eggs (from the chicks next door), and chopped cilantro tossed with our own Ambrosia (teriyaki sauce). We’re feeling better already.